In Croatia there is an impressive number of churches, cathedrals and basilicas. If you want to see beautiful churches and cathedrals in Croatia, Uniline offers you a rich selection of tickets for churches and cathedrals. Some of the most famous cathedrals in Croatia are Trogir Cathedral of St. Lawrence, which is under UNESCO protection. This cathedral will impress you with its unique style from baroque to romanticism. The construction of the Cathedral or St.Lawrence began at 1213. and finished during the 17th century. The bell tower of the cathedral was built up for almost 4 centuries, while the interior of the cathedral keeps many statues and artistic deeds. Eufrazijeva Basilica, built in the 553rd year, is also known by the name Eufrazijana,is situated in the old town of Porec. Slender luxurious marble columns supporting the cathedral and the interior and the facade painted with beautiful mosaics which are one of the finest works of Byzantine art, will simply impress you. 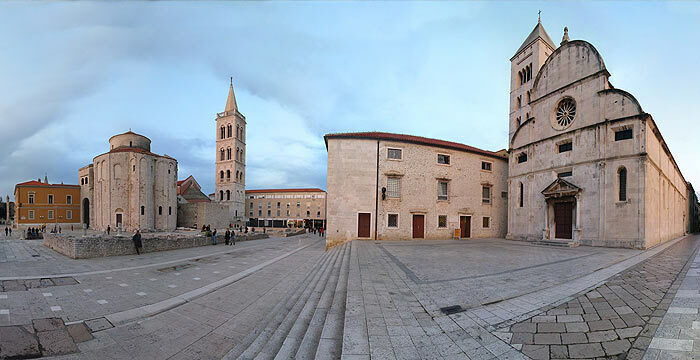 The Euphrasius’ Basilica complex consists further of the Atrium, the Baptistry, the bellfry, mosaics and sacred objects from the 3rd, 4th and 5th century as well as the surrounding Bishop court in which was not long ago situated the sacred collection of the diocese of Poreč - Pula. The complex has been listed by UNESCO in 1997 as a Worlds Heritage Site.